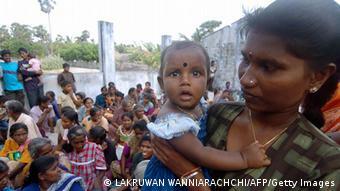 What are Rajapaksa’s chances of getting elected? 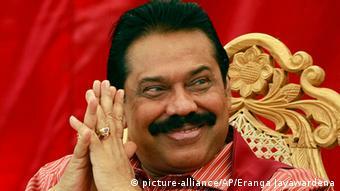 Sri Lanka’s wartime president, Mahinda Rajapaksa, is set to contest in the August parliamentary election. But how would the return of the long-time leader impact the nation’s politics? DW spoke to analyst Alan Keenan. A coalition – formally headed by Sri Lankan President Maithripala Sirisena – has nominated Rajapaksa to run in the upcoming parliamentary polls, due on August 17. The 69-year-old, considered a war hero by the country’s majority Sinhalese for ending a three-decade civil war in 2009, will stand in the South Asian nation’s third-largest electoral district, Kurunagala, where many voters have relatives in the military. The former president’s allies say he will stand for the post of prime minister. Should Rajapaksa win and succeed in becoming the country’s next premier, he will have more powers than his predecessors, after the current president enhanced some of the powers of the post with reforms back in April. Sirisena, a former minister in Rajapaksa’s administration, defected last year to run for president, and succeeded in defeating him in a bitterly fought election in January on promises of full-scale political reforms, which included reducing powers of the presidency and changes to the electoral system. But Sirisena is facing resistance from lawmakers, as his six-month-old coalition government with PM Ranil Wickramasinghe has struggled to pass key political reforms. In a DW interview, Alan Keenan, Sri Lanka analyst at the International Crisis Group (ICG), talks about why he believes Rajapaksa has decided to contest the upcoming election, the implications for the country’s politics should he be elected, and the rivalry between Rajapaksa and Sirisena. Alan Keenan: Rajapaksa, like many in Sri Lanka, was shocked by his loss to Sirisena in January’s election. He has blamed his defeat on Tamil and Muslim voters, implying that the majority he won among Sinhala voters – who make up about 75 percent of the population – should have been enough to keep him in office. He and prominent supporters have claimed he was the victim of an international conspiracy, led by India and the United States. Rajapaksa is also likely wishing to protect himself and his family against possible prosecution for alleged corruption – and war crimes – committed under his administration. Were he to gain the premiership, there would be little chance that any of the current investigations into corruption would result in prosecutions. Many of his close parliamentary allies are also being investigated and have encouraged his return to power. Rajapaksa is not technically running for prime minister, however, but is instead contesting for a parliamentary seat as a candidate with the United People’s Freedom Alliance (UPFA), the coalition that he headed when he was president from 2005-2015. Within weeks of being elected president, Sirisena was named the chairman of the Sri Lanka Freedom Party (SLFP) – the party whose general secretary he had been until he decided to challenge Rajapaksa for the presidency in November 2014. Later he was made chairman of the UPFA, a coalition of parties dominated by the SLFP. News that Rajapaksa – after a months long campaign by UPFA and SLFP supporters – had been given a nomination for the upcoming election was met with anger – and even cries of “betrayal” – by many of those who had campaigned for Sirisena against Rajapaksa. In fact, however, under party rules, Sirisena had no ability to block the nomination. Despite Sirisena’s repeated promises that Rajapaksa would not get a nomination, lacking a majority of the SLFP and UPFA in agreement, Sirisena was outvoted. Sirisena did have the option of breaking with the majority of the SLFP leadership, but this would have split the party. As a loyal member of the SLFP for more than forty years, Sirisena didn’t want to go down in history as the man who divided the party and led it to a major parliamentary defeat. It would have ceded party control to Rajapaksa and hurt the prospects of Sirisena’s supporters in the party. With hindsight, some think it was a mistake for Sirisena to take over formal leadership of the SLFP and UPFA, as it trapped him in a drawn out negotiation process with Rajapaksa and his allies that weakened Sirisena’s leadership and damaged his claims to be a reformer. Sirisena’s clear rejection of Rajapaksa in his July 14 statement to the nation, however, with his call for Rajapaksa’s defeat in the August 17 election, opens up another scenario: Rajapaksa’s candidacy may lead not to his return to power, but to a second and even more humiliating defeat, leaving Rajapaksa in charge of a weakened rump faction of the UPFA in a parliament dominated by the UNP and its allies. Only time will tell. Many have been expecting the election to be close, and Rajapaksa and the UPFA should win a sizeable portion of the vote. Nonetheless, the broad coalition of parties the UNP has put together – which, like the coalition that brought Sirisena to power, brings together Sinhala, Muslim and Tamil parties – would appear at the start of the campaign to have the momentum and a strong chance of victory. Their campaign was given a big boost by Sirisena’s July 14 statement to the nation, in which he reiterated his strong opposition to Rajapaksa contesting and becoming prime minister. Nonetheless, Sri Lankan politics has already produced big surprises over the last year and further twists cannot be ruled out. Rajapaksa is expected to campaign on Sinhala nationalist themes, warning that the opposition United National Party (UNP), led by Prime Minister Ranil Wickremasinghe, has weakened the military, supported Tamil separatists, and put Sri Lanka’s national security at risk. January’s presidential election, however, suggested that Rajapaksa’s Sinhala nationalist themes have lost some of their resonance with voters. Without any Muslim candidates and very few Tamils, the UPFA would have to win big victories in Sinhala districts to gain a majority. It’s not so much that the next prime minister will have new powers, but that the president now has fewer. 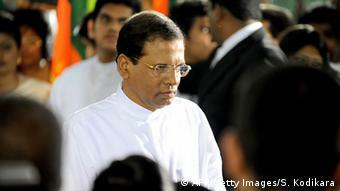 One of the central, and very popular, promises in Sirisena’s January 2015 presidential campaign was to end the near absolute powers of the executive presidency, which had badly distorted Sri Lanka’s democratic system. Sirisena’s two predecessors as president, including Mahinda Rajapaksa, had promised to change the system but failed to do so. While many of Sirisena’s supporters hoped he would be able to abolish the executive presidency as a whole, his lack of a parliamentary majority, and resistance from the UPFA, meant he had to settle for more limited reforms. The 19th amendment, passed in late April, limits the president to two terms, restricts his ability to dissolve parliament early and call snap elections, ends the absolute immunity from court challenge to a president’s actions, and gives the prime minister significant control over cabinet appointments. Given his tense relationship with the current President, how would Rajapaksa’s return as PM affect Sri Lankan politics? The key policies Sirisena campaigned on and has begun to implement as president, with the support of the UNP, are fundamentally at odds with Rajapaksa’s favored policies. While a modus vivendi might be found, a Sirisena-Rajapaksa cohabitation would lead to a tense and volatile situation and block progress on Sri Lanka’s many deep challenges: ending large-scale corruption, strengthening independent institutions and the rule of law, reducing the role of the military, nurturing post-war reconciliation and justice, and finding a lasting settlement to the country’s longstanding ethnic and religious divisions. This potential scenario, and Sirisena’s continuing popularity, may offer an additional incentive for some voters to reject the UPFA and back the UNP-led coalition.